‘Hero-Worship’ is something that has time and again been derided by the intellectuals of all hues, and rightly so. But ‘hero-worship’ is also a phase of one’s life. I have no hesitation in accepting that there are some personalities, for example, the poet-novelists, D H Lawrence and Nagarjun; the post-colonial critic Edward W. Said, about whom I am yet to develop an intellectual detachment. I am sure, by and by, some kind of broader understanding would be developed to enable me to have that kind of detachment, as without ‘doubt’, one’s faith in itself remains a doubtful thing. 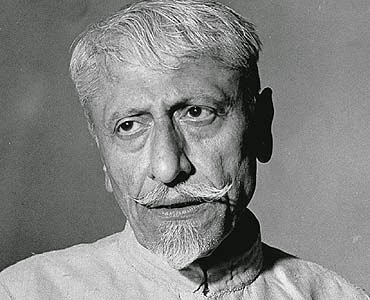 In this category of ‘heroes’, I will surely include Maulana Abul Kalam Azad (1888-1958), the first Education Minister of the independent India, but more importantly, one of the few stalwarts of national movement who could imbibe and contribute to the very essence of that elusive ‘inclusive nationalism’ that we nowadays are trying hard to figure out. 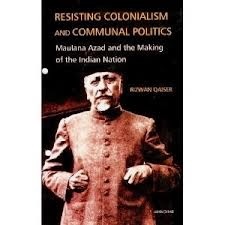 I am no historian, but have deep interest in the historical process through which Indian civilization, in particular, has progressed, and hence the placement of Maulana Azad in Indian history, is very significant and runs deep into the secular and inclusive fabric. However, C Rajagopalachari’s description of Maulana Azad as ‘The Great Akbar’ of Modern India, quoted recently by the eminent historian Prof. Mushirul Hasan in an article in The Hindu (http://www.thehindu.com/opinion/lead/the-great-akbar-of-independence-struggle/article5326492.ece) would be akin to romanticizing Maulana’s plight, and overlooking his tragedy. In fact, if at all he needs to be compared with any other figure from the Medieval period, it can be no other than Dara Shikoh. Because, while, the ‘Emperor’ Akbar was successful in establishing an empire that he wished to as per his multi-cultural vision of the country, Maulana Azad was almost ‘sidelined’ like Dara Shikoh, because he found himself at the crossfire of the majority and minority brands of communalism, where, like Mahatama Gandhi, his voice of sanity had few takers when it really mattered. If Akbar is a triumphant symbol of Hindu-Muslim unity, then Dara Shikoh is a tragic symbol of the same, and Maulana Azad’s position makes him nearer to that of that Sanskrit-Persian poet-scholar, and brother of Aurangzeb, because despite his life-long struggle, he, as other champions of Hindu-Muslim unity, could not avert the Partition of the country and the mass-tragedy that followed. It is no wonder then that Maulana Azad once compared himself to Sarmad, the 17th Century mystic and Persian poet, and one of the 'gurus' of Dara Shikoh. What is remarkable, and that is why I perhaps find some kind of link among as varied people as D H Lawrence, Nagarjun, Edward Said and Maulana Azad, is their ability to recognize and put forth unambiguously that life is a two-way window, rather multi-way, and only the ones who can appreciate the same, can ever hope to contribute vibrantly, and alter meaningfully, the course of history, as each of them did in his chosen field of work. .....But whatever the roots of our problems might be, it is obvious that India, like other countries, has her internal problems. Of these, the communal problem is an important one. We do not and cannot expect the British Government to deny its existence. The communal problem is undoubtedly with us; and if we want to go ahead, we must needs take it into account. Every step that we take by ignoring it will be a wrong step. The problem is there; to admit its existence, however, does not mean that it should be used as a weapon against India's national freedom. British Imperialism has always exploited it to this end. If Britain desires to end her imperialistic methods in India and close that dismal chapter of history, then the first signs of this change must naturally appear in her treatment of the communal problem. What is the Congress position in regard to this problem? 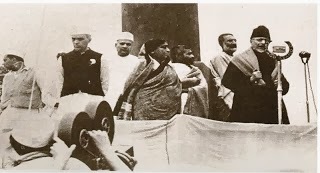 It has been the claim of the Congress, from its earliest beginnings, that it considers India as a nation, and takes every step in the interest of the nation as a whole. This entitles the world to examine the truth of its assertion. I wish to examine afresh this question from this point of view. There can be only three aspects of the communal problem: its existence, its importance, and the method of its solution. We could attach no greater importance to it, than to make it the first condition for the attainment of our national goal. The Congress has always held this belief; no one can challenge this fact. It has always held to two basic principles in this connection, and every step was taken deliberately with these in view. .
(1) Whatever constitution is adopted for India, there must be the fullest guarantees in it for the rights and interests of minorities. (2) The minorities should judge tor themselves what safeguards are necessary for the protection of their rights and interests. The majority should not decide this. Therefore the decision in this respect must depend upon the consent of the minorities and not on a majority vote. When these principles are accepted and acted upon by the Congress, what is it that obliges British statesmen to remind us so often of the problem of the minorities, and to make the world believe that this stands in the way of Indian freedom? If it is really so, why does not the British Government recognise clearly India's freedom, and give us an opportunity to solve this problem forever by mutual agreement amongst ourselves? We have considered the problem of the minorities of India. But are the Muslims such a minority as to have the least doubt or fear about their future? A small minority may legitimately have fears and apprehensions, but can the Muslims allow themselves to be disturbed by them? I do not know how many of you are familiar with my writings, twenty-eight years ago, in the "Al Hilal." If there are any such here, I would request them to refresh their memories. Even then I gave expression to my conviction, and I repeat this today, that in the texture of Indian Politics, nothing is further removed from the truth than to say that Indian Muslims occupy the position of a political minority. It is equally absurd for them to be apprehensive about their rights and interests in a democratic India. This fundamental mistake has opened the door to countless misunderstandings. False arguments were built up on wrong premises. This error, on the one hand, brought confusion into the minds of Musalmans about their own true position; and,on the other hand, it involved the world in misunderstandings, so that the picture of India could not be seen in right perspective. If time had permitted, I would have told you in detail how during the last sixty years, this artificial and untrue picture of India was made, and whose hands traced it. In effect, this was the result of the same policy of divide and rule which took particular shape in the mirlds of British Officialdom in India after the Congress launched the national movement. The object of this was to prepare the Musalmans for use against the new political awakening. In this plan, prominence was given to two points. Thus were sown the seeds of disunity by British Imperialism on Indian soil. The plant grew and was nurtured and spread its nettles; and even though fifty years have passed since then, the roots are still there.Politically speaking, the word minority does not mean just a group that is so small in number and so lacking in other qualities that give strength, that it has no confidence in its own capacity to protect itself from the much larger group that surrounds it. It is not enough that the group should be relatively the smaller, but that it should be absolutely so small as to be incapable of protecting its interests. Thus this is not merely a question of numbers; other factors count also. If a country has two major groups numbering a million and two millions respectively, it does not necessarily follow that because one is half the other, therefore it must call itself politically a minority and consider itself weak. If this is the right test, let us apply it to the position of the Muslims in India. You will see at a glance a vast concourse, spreading out all over the country; they stand erect, and to imagine that they exist helpllessly as a "minority" is to delude oneself. The Muslims in India number between eighty and ninety millions. The same type of social or racial divisions which affect other communities do not divide them. The powerful bonds of Islamic brotherhood and equality have protected them to a large extent from the weakness that flows from social divisions. It is true that they number only one-fourth of the total population; but the question is not one of population ratio, but of the large numbers and the strength behind them. Can such a vast mass of humanity have any legitimate reason for apprehension that in a free and democratic India, it might be unable to protect its rights and interest? These numbers are not confined to any particular area, but spread out unevenly over different parts of the country. In four provinces out of eleven in India there is a Muslim majority, the other religious groups being minorities. If British Baluchistan is added, there are five provinces with Muslim majority. Even if we are compelled at present to consider this question on a basis of religious groupings, the position of the Muslims is not that of a minority only. If they are in a minority in seven provinces, they are in a majority in five. This being so, there is absolutely no reason why they should be oppressed by the feeling of being a minority. I cannot believe for an instant that there can be any room whatever for these misgivings in the picture of India's future. These apprehensions are arising because, in the words of a British statesman regarding Ireland, we are yet standing on the banks of the river and, though wishing to swim, are unwilling to enter the water. There is only one remedy: we should take the plunge fearlessly. No sooner is this done [than] we shall realise that all our apprehensions were without foundation. But if we are convinced that for us fear and doubt have no place, and that we must view the future with courage and confidence in ourselves, then our course of action becomes absolutely clear. We find ourselves in a new world, which is free from the dark shadows of doubt, vacillation, inaction, and apathy, and where the light of faith and determination, action and enthusiasm, never fails. The confusions of the times, the ups and downs that come our way, the difficulties that beset our thorny path, cannot change the direction of our steps. It becomes our bounden duty then to march with assured steps to India's national goal. I started the "Al Hilal" in 1912, and put this conclusion of mine before the Muslims of India. I need not remind you that my cries were not without effect. The period from 1912 to 1918 marked a new phase in the political awakening of the Muslims. Towards the end of 1920, on my release after four years of internment, I found that the political ideology of the Musalmans had broken through its old mould and was taking another shape. Twenty years have gone by and much has happened since then. The tide of events has ever risen higher, and fresh waves of thought have enveloped us. But this fact still remains unchanged: that the general opinion amongst the Muslims is opposed to going back. I am a Musalman and am proud of that fact. Islam's splendid traditions of thirteen hundred years are my inheritance. I am unwilling to lose even the smallest part of this inheritance. The teaching and history of Islam, its arts and letters and civilisation, are my wealth and my fortune. It is my duty to protect them. It was India's historic destiny that many human races and cultures and religions should flow to her, finding a home in her hospitable soil, and that many a caravan should find rest here. Even before the dawn of history, these caravans trekked into India, and wave after wave of newcomers followed. This vast and fertile land gave welcome to all, and took them to her bosom. One of the last of these caravans, following the footsteps of its predecessors, was that of the followers of Islam. This came here and settled here for good. This led to a meeting of the culture-currents of two different races. Like the Ganga and Jumna, they flowed for a while through separate courses, but nature's immutable law brought them together and joined them in a sangam. This fusion was a notable event in history. Since then, destiny, in her own hidden way, began to fashion a new India in place of the old. We brought our treasures with us, and India too was full of the riches of her own precious heritage. We gave our wealth to her, and she unlocked the doors of her own treasures to us. We gave her what she needed most, the most precious of gifts from Islam's treasury, the message of democracy and human equality.